My taxi driver laughed at me for coming to Ireland to learn to speak Irish. The United Kingdom and Ireland are among the lowest-ranked countries in Europe for learning languages. 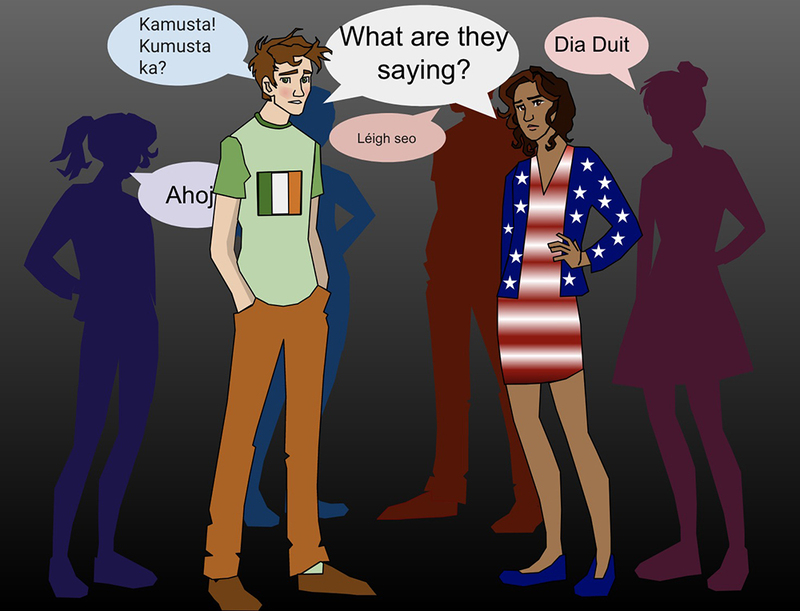 Almost three-quarters of Irish people can’t speak a foreign language. Both countries share a common language and problem: English. Many Anglophone countries view English as the default language. Native English speakers learn more than an eclectic language full of idiosyncrasies; they inherit the mindset of arrogance and laziness that lurks underneath. Learning Irish is like watching a language die before your eyes because not enough people care. In 2010, the Irish government passed the 20-Year Strategy for the Irish Language aiming to more than double the number of daily Irish speakers through reforming the education system and making the language more present in public life. Currently, only 1.7 percent of the population speaks Irish on a daily basis. Living in Dublin, I can’t avoid Irish. Street signs are in both English and Irish. When I take the tram to work, the stops are announced in Irish first. All exhibits in the national museums utilize both languages. I pass countless posters advertising adult Irish language classes, Gaeilgeoirí (Irish speakers) meetups or other language learning resources. If you want to learn Irish, the government has made it as accessible and easy as possible to do so. But no one wants to. Since the initiative, the number of daily Irish speakers in the Gaeltacht, or primarily Irish speaking regions, has dropped. If the language only exists in government documents and media, it’s practically dead. At a pub in Belfast, a man introduced himself to me in Irish — “Is mise Jared. Cad is ainm duit?” I couldn’t hear him over the chatter and clink of glasses around us and shook my head in apology. “You’re Irish, and yet you can’t speak Irish?” he scoffed. This was the only time anyone has spoken to me in Irish outside of the classroom. He may still be looking for someone to talk to. Irish is a difficult language. It’s one of the oldest literary languages in the world and sounds like nothing else. If Irish people can’t bother to learn their native language with all the resources available, how can they put the effort to learn foreign languages? English is my first language, but it shouldn’t have been. Growing up in the care of my Filipino grandparents who spoke primarily Ilocano and little English, I should speak the language fluently. My mother says that every time they tried to teach me, I’d tell them, “No, grandma! You’re speaking bad language!” And I’d go back to watching television. As a child, English had already warped my brain into thinking that there’s no need for other languages. At that age, I assumed everyone would, and should, speak English –– the “good” language. I have trouble communicating with the majority of my family back in the Philippines, even with my cousins who are my age. I can hold basic conversations with my grandparents in English, but I don’t know their histories — I don’t know anything really about their lives. Their stories are locked in Ilocano. All of my cousins who grew up speaking English don’t know Ilocano, and our family history ends with us. The expediency of English overpowers my desire to learn other languages. Over my spring break, I traveled to five countries within a week. English wasn’t the main language in many of them, and that didn’t even cross my mind until a week before I left. I considered learning a few basic phrases in German or Slovakian, but I thought, “No need, I’ll find someone who speaks English.” It takes an embarrassing amount of arrogance to expect people to accommodate my language needs in their country, while I barely acknowledge their language. Sitting in restaurants in Bratislava where no one spoke English, I felt worse than inconsiderate. In the United States, some insist everyone speak English. But here, because I spoke only English, I was the problem. The casualties in the global spread of English include native English speakers. We are only stunting ourselves by being comfortable with monolingualism. Languages with a small number of speakers are worth learning, even if it’s just to have a conversation with a stranger in a pub. Is mise Kristine. Tá mé i mo chónaí i mBaile Átha Cliath ach is de bhunadh Filipíneach mo mhuintir. Kristine White is a junior English major. She can be reached at kwhite2@oxy.edu.